Strategically located with 1600kms coastline, the longest among maritime states in India, Gujarat is the nearest gateway to the Middle East, Africa and Europe. Located in the Kutch district of Gujarat, Mundra lies on the north shores of the Gulf of Kutch about 50 kilometers south of Anjar and 44 kilometers to the east of the Port of Mandvi. The Port of Mundra is India’s biggest private port. It is not only a private port, but it is also a special economic zone. From its inception in 2003 MICT has had alternative thinking as part of every aspect of its business. The result speaks clearly through the volume it handles today, and the confidence it has built up within the trade community. 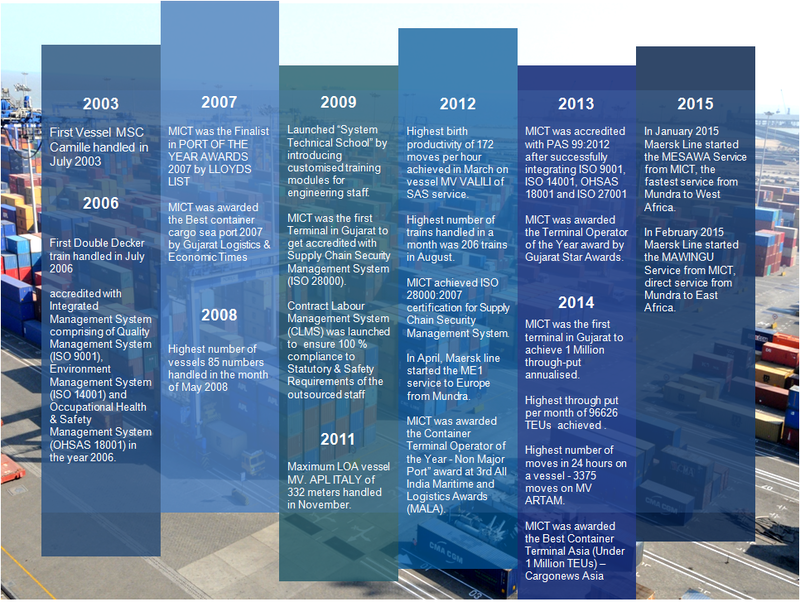 From handling 20,000 TEUs in its first year of operations, today MICT has developed the port into a million TEU port. Driving this customer experience is MICT’s emphasis on enabling the faster turnaround of vessels by increasing operational efficiency. MICT has today emerged as India’s most promising mainline port receiving nearly 70 vessels each month including 10 mainline services. MICT has invested in advanced port management IT systems and state of the art equipment which are at par with the best in the world. MICT’s USP is that with a draught of 14.5m alongside, and the terminal is one of the few container terminals in India with an ability to handle the large 10,000 TEU vessels that require a deep draft.